Where Butterflies Rest, Damage Runs Rampant. (Foreign Desk) Ginger Thompson. The illegal loggers smeared mud on their faces to hide their identities. Then they smashed a camera they feared would expose their pillaging. The evidence, however, was everywhere. Two trucks rumbled down the mountain with illegally cut wood. The mud-smeared loggers had fresh blood under their fingernails from loading. In a federally protected forest that is a winter haven for the monarch butterfly, the landscape was as barren as the moon. This is Mexico's most famous national park, a 10,000-year-old evergreen forest set aside by presidential decree and supported by millions of dollars in international aid for colonies of orange and gold butterflies that migrate annually from the United States and Canada, in clouds that look like fire in the sky. 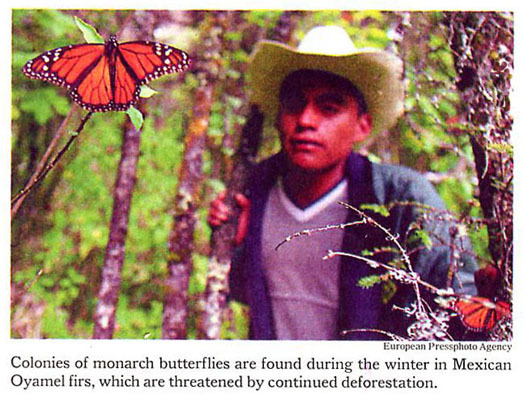 But when the butterflies leave each spring, and the hundreds of thousands of tourists go home, this reserve stretching west from the suburbs of Mexico City to the mountains of Michoacan becomes a symbol of the rapid destruction of all the nation's forests, and is overtaken by organized crime and mob justice. Heavily armed mafias chop down the trees at an alarming rate -- about 70 mature trees each day, or a small forest a week, Mexican authorities say. The mobs ambush the police and terrorize village leaders who threaten to stop them. Left alone to defend their property, some beleaguered villages take the law into their own hands to fight back against the loggers, often using the same violent tactics. Most villages surrender and sell their trees. The police and government environmental inspectors have also been attacked, and rarely venture into villages like San Luis, unless they do so en masse and in military style. Officers and inspectors have been detained for hours by criminal mobs that set their vehicles on fire. The loggers have staged roadblocks to take back trucks of wood that had been confiscated by the police; and stormed jails to free their leaders. Victor Lichtinger, a former minister of the environment, said that in much of the world including most of Mexico, deforestation remains a largely quiet phenomenon, spreading almost a tree at a time, and driven by the poverty of rural farmers who cut down small plots of the forest to make way for subsistence crops. But Mexico's forests, he added, are also the strongholds of drug traffickers and armed rebels. They are seething with tensions from unresolved land disputes that go back generations. They are far removed from the reaches of the law. From the day the government established the Monarch Butterfly Biosphere Reserve, peasants here have lived at odds with the government, and the deforestation turned fast and turbulent. Mexico had given this land to peasants from the spoils of the revolution. With the creation of the reserve in 1986, the peasants accused the government of taking their land away. The people of San Cristobal, at the southern edge of the butterfly reserve, burned down their trees, rather than cede control to the government. Fourteen years later, the Mexican government expanded the reserve to more than 132,000 acres from 45,000 acres, offering peasants who live in extreme poverty few economic incentives to save their trees. The tensions, and deforestation, spread. Now, as the demand for wood grows in factories, construction companies and fruit packing plants, middlemen have moved into the forests offering good money for timber -- about five times the average daily wage for a 60-year-old pine -- and peasants have decided to do business. The governor said the growing tensions in the butterfly reserve were one result of a three-year-old crackdown against industries around the area that buy illegal wood. Some 100 sawmills had been closed or fined, he said, and 159 people had been arrested, most of them poor workers. He said he supported President Fox's decision to send the military. 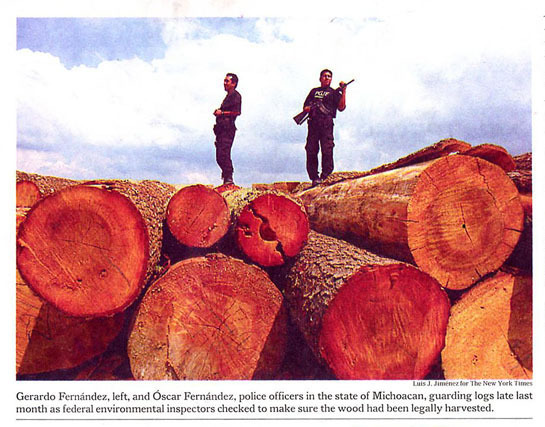 Federal environmental authorities are also strapped for money and manpower. Unlike the United States, where nearly 2,000 permanent and seasonal armed rangers patrol 387 national parks, Mexico's protected areas are hardly protected at all, with fewer than 400 roving, unarmed inspectors assigned to watch over 150 natural reserves. Diana Ponce, a deputy prosecutor for Profepa, the agency charged with protecting Mexico's natural resources, said peasants are ravaging forests from Chihuahua to Chiapas. She estimated that the country loses about 1.3 million acres of forests each year, the fifth worst deforestation rate in the world. Some 70,000 acres are cut down each year from the Lacandon rain forest, home of the Zapatista National Liberation Army and the hemisphere's most biologically diverse jungle after the Amazon. Environmentalists predict it could disappear within the next two decades. The old-growth pine forests in the northern Sierra Tarahumara and its rich diversity of wildlife face threats from drug traffickers who burn down the trees up to 200 years old to plant marijuana. Villagers who stand against the traffickers have been killed. Two peasant leaders, Isidro Baldenegro Lopez and Hermenegildo Rivas Carillo, were arrested last year without warrants. Amnesty International considers them prisoners of conscience, comparing their arrests to the government's abuses against the forest crusaders Rodolfo Montiel and Teodoro Cabrera of the state of Guerrero. But no forest's plight draws more attention these days than the monarch butterfly reserve. The World Wildlife Fund reported two years ago that some 40 percent of the butterfly reserve had been destroyed from 1971 to 1999. Last month, the organization reported that more than 500 hectares have been lost in the last three years. Aerial photographs, the group said, showed that the villages of Francisco Serrato and Emiliano Zapata had lost all of their forests. People in the ejido of El Paso fight hard to hold on to their forest. The camp of plastic tents beneath their towering pine and Oyamel firs is their battle station, manned by grandmothers and sons, who leave their homes five days a week to help guard the trees. Last year, the leader of the ejido, Armando Sanchez Martinez, discovered a truck loaded with wood that had been illegally cut from their forest. He set it on fire. Then a couple of months ago, after gunmen fired on his truck, Mr. Sanchez bought a handful of rifles and handguns and recruited the other ejido residents to serve on civilian patrols. Their support, he said, was unanimous.